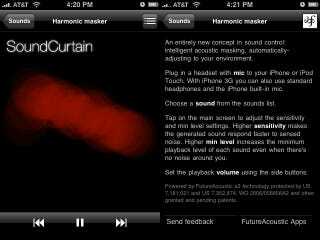 Sound Curtain is a very, very simple noise masking app that works on the iPhone when you're wearing a set of mic-enabled headphones. It performs much better than its $0.99 price would imply. There's three options: White noise, rainfall and harmonic tones. The white noise is decent if you've been using a white noise machine for a while, but the rainfall and harmonic tones can actually relax you in addition to its noise masking properties.